Here are some tips and tricks that help you use calibre (http://calibre-ebook.com/)ebook management software more effectively. 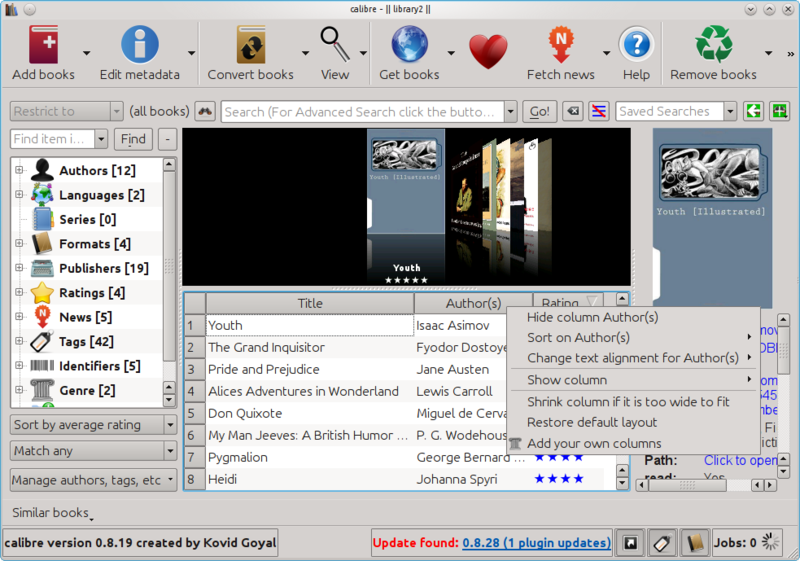 The main calibre window has a default set of columns that most people find useful in organising their ebook collection. These include Title, Author, Date, Size (of file in MB), Ratings, Tags , Series, Publisher and Published. Although these columns are sufficient for many users, most calibre features are made flexible to accommodate unusual needs and whims. The set of columns in the main window can be easily customized to include those columns that you find most useful. This demo video (the part between approximately 2 and 4 minutes of the 14 minute long video) illustrates how to manipulate the contents of columns as well as how to delete unwanted columns and add custom columns. Manipulating the columns: Depending on your screen size only a few columns can be made visible so you will only want to include columns that are useful to you. If you need more columns than fit in your screen, you can move the most useful ones to the left so they are always visible. The order of the columns can be changed by left clicking on the column title and dragging it to the left or right of other column titles. As shown in the figure below you can right click on the column title to see ways in which you can manipulate it. You can hide the column if it is not useful to you. You can also sort the entries in your library in ascending or descending order of the entries in a particular column like the rating; having the highest rated bpooks on top and the lowest rated at the bottom of your list. 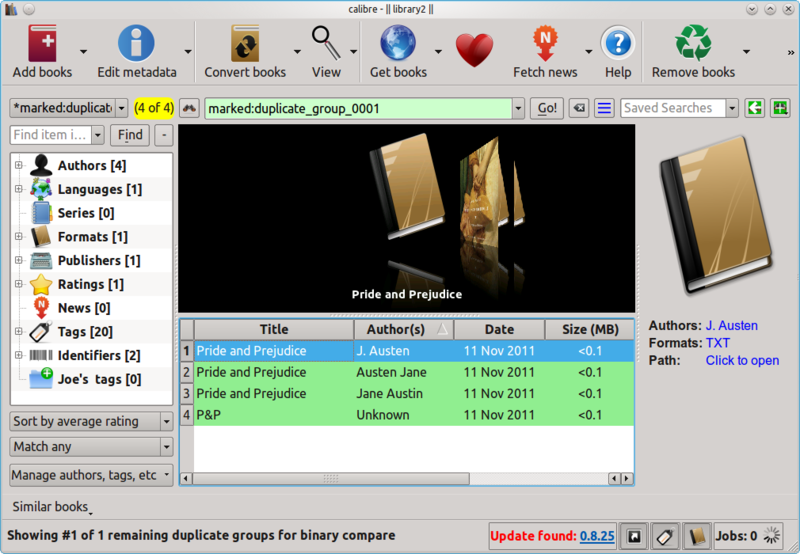 This can also be used to arrange books in alphabetical (or reverse alphabetical) order of author or title. You can also implement this by simply left clicking on the title of the column you want to sort by. If you want the order reversed just click on the column title again. If the entries are arranged in descending (ascending) order of the entries in a particular column a little grey downward (upward) pointing arrow appears next to the column title; like for the Rating column in the figure above. For a text type column like author or title you can choose the the text to be left, right, or center aligned. You can manipulate the width of the columns by hovering the mouse between two column titles, once the left-right double sided arrow icon shows up you can drag it left or right to adjust the width. 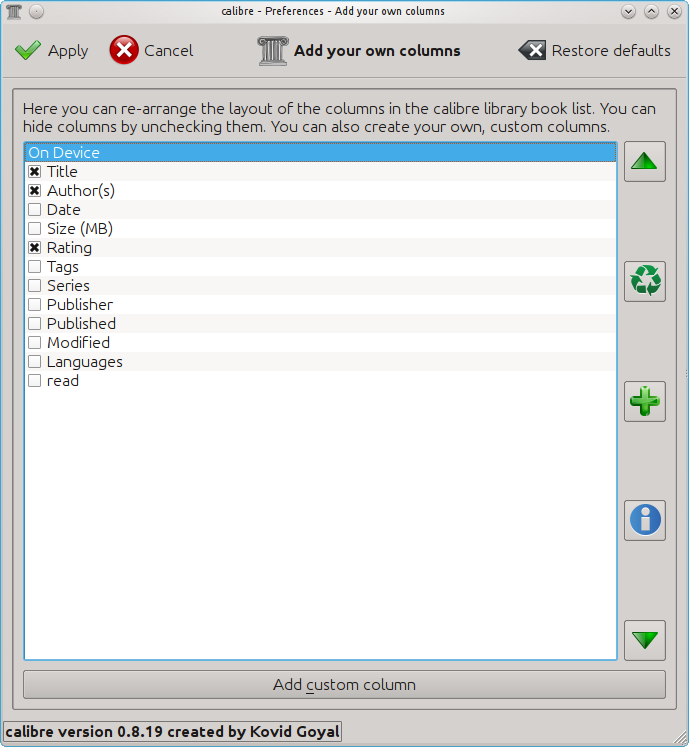 Adding custom columns: To add a custom column click on Preferences in the main calibre tool bar and in the new window that opens click "Add your own columns" in the first row of icons under Interface. The following window appears. The columns marked with an "x" are the visible columns in your main calibre window. You can select or unselect columns here to choose which ones should be visible. To add a column not on the list click the green "+" sign button on the right and the following window appears. First you must choose the nature of entries in your custom column. The figure above shows the available data types including integer numbers, text, binary yes and no entries, dates, floating point numbers, etc. This blog post will illustrate examples of two different data type columns. Example Binary Yes/No type column: Here we are going to create a binary Yes/No type column with column heading "Read", look up name "read" and column type Yes/No. The entry Yes in this column indicates the book is read and No indicates the book is not yet read. 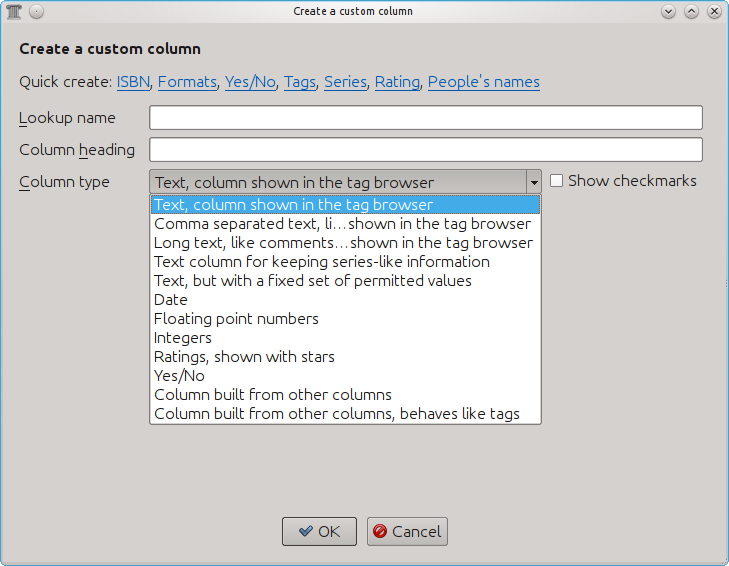 After filling the entries and clicking OK in the window in the above figure a new column appears with title "Read" in the main calibre window. By double clicking in the position of the entries of this column a drop down box opens that allows you to select "Yes" or "No" or leave it blank as shown in the figure below. So you can now mark the read status of the ebooks in you collection as done for a few in the figure below. A green tick indicates Yes or read and a white cross in a red circle indicates No or not read. You can also leave the read status blank. Example Text with fixed set of permitted values type column: We will use this type of column to indicate the genre of the book. The figure below shows how we have chosen the values and corresponding colors for the entries in this column. Setting the column up as shown above will create a column titled Genre with allowed entries Adventure, Mystery, Classic, Humour, Play and News as shown below. The adventure entry will always be in black the Mystery entry in blue etc. To fill the entries of this column as before double click on the column entry and a drop down box will show up with the allowed entries as shown in the figure above. The figure above also shows a few books with this entry filled in and the News entry is in red while the Humour entry is in green. 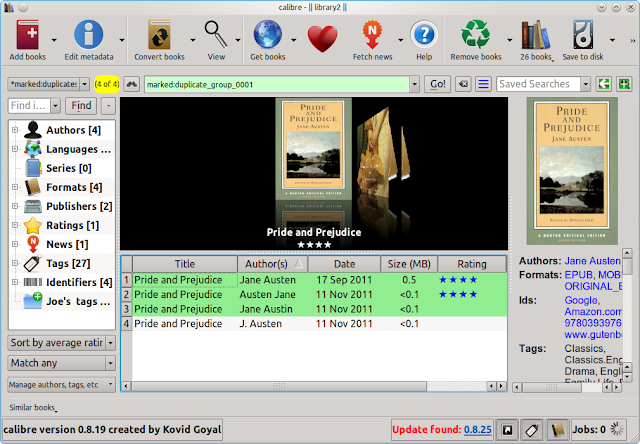 The colors will help quickly distinguish the different genre at a glance. Hope you have fun playing around with various types of custom columns this week and find it useful. See you again in about a week. The last blog post talked about plugins in general and illustrated the workings of the duplicate finder plugin in detail. Today I will point out a few other useful plugins. To obtain these plugins follow the same procedure as in the section "Getting the Find Duplicates plugin" in the previous blog post, but with the name of the plugin replaced with the one you are looking for. You may encounter a window in the process that asks you where you would like to install the plugin icon. In the following I have assumed that once you install the plugin the icon is available in the main calibre tool bar. If your screen size is small or if you have too many icons in the main tool bar not all of them will be visible. To see them all click on the little ">>" sign at the extreme right corner of the main tool bar. Generate Cover Plugin: This plugin was developed by Grant Drake. Click here to go to the mobileread forum on this plugin. The plugin helps you generate custom covers for those books that you cant find a cover for via download metadata or if you simply don't like the available covers. It can also be used to make covers for personal documents like collections of letters or magazine articles or news downloads. The plugin uses available metadata to create the cover. 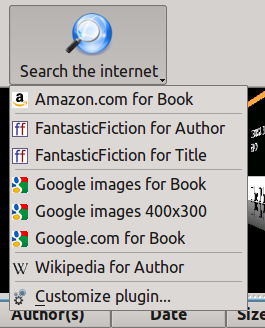 The following figure shows the icon for the plugin you will see in your toolbar. 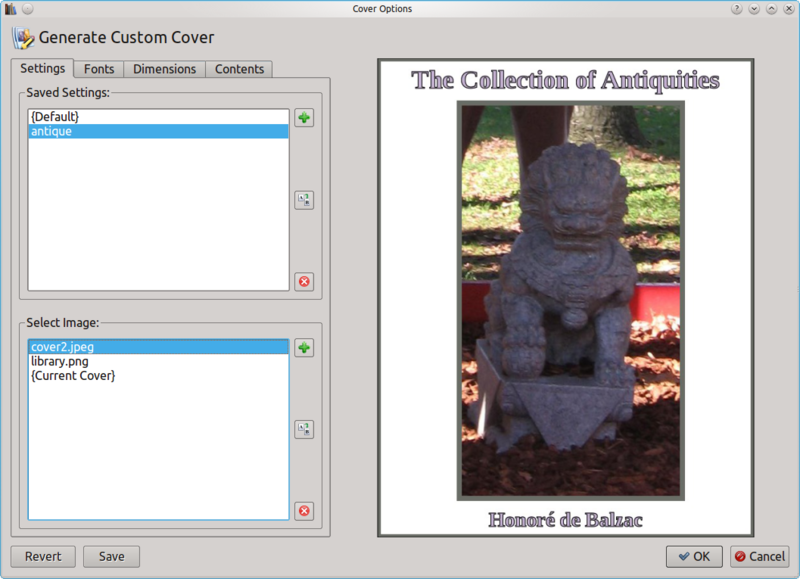 Select the ebook, you want to generate a cover for, in the main calibre window. Then click on the above icon. The following window appears. 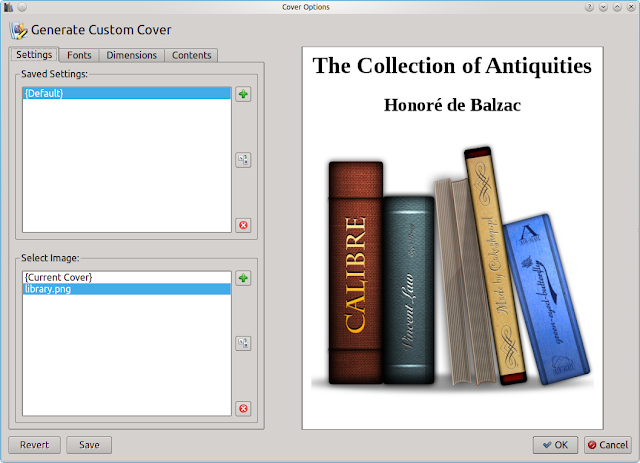 The right side of the window shows the default cover the plugin generates. But this can be customized to your taste. The first tab in this window is "Settings". Below it you will see "Saved Settings" where there will be the "Default" option that will have all the settings of fonts, dimensions, images and contents of the cover shown on the right. You can either add a new setting or just change the default settings. To create a new setting click on the green "+" sign on the right hand top corner of "Saved Settings". A window will open that will allow you to choose a name for the setting. In this example I have chosen "antique" as you can see in the figure below. After "Saved Settings" is "Select Image". Here you can click on the green "+" sign to choose an image stored somewhere on your computer. The next tab "Fonts" allows you to choose the font sizes for the title, the author, the series and any other custom text you want to display on the cover. Under this tab you can also choose the background color, the border color, the text color, if the text should have a border and if it does what color the text border should be. The next tab is "Dimensions", under which you can choose the cover height and width. You can also choose margin sizes and border thickness of both image and cover. Finally the last tab is "Contents". Here you can choose what metadata to display in the "Field Order" section. In the following figure title, author and image are included. You can also choose the order in which these are displayed. For example in the figure below author is moved below image, while it is above image in the figure above. To do this I just selected "Author" under the "Field Order" and clicked the down green arrow to move it below "Image". Under this tab you can also add some custom text you would like displayed (I have not put any), but the "Custom Text" will have to be selected in the "Field Order" section. Goodreads Sync: This plugin was developed by Grant Drake. Click here to go to the mobileread forum on this plugin. Some of you may have Goodreads accounts and you may want to synchronise your goodreads shelves with your calibre collection. This plugin helps with doing that. 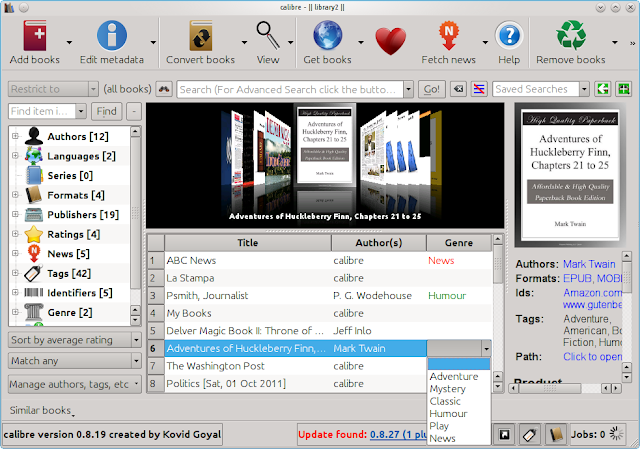 The figure below shows the icon of this plugin in the main tool bar along with available options. The "Add to shelf" option allows you to add slected calibre ebooks to your "read", "currently-reading" and "to-read" shelves in your goodreads account. When I select the ebook "A Collection of Antiques" in my ebook collection and click add to shelf the following window appears. Now just click "Add to shelf" to have it added to your appropriate goodreads shelf. To use the second option "Sync from shelf", you need to first set it up. First click on the "Customize plugin" option. In the new window that opens, double click on an entry of interest under "Sync Actions" and tell calibre what it should do with matching linked books. Now the synchronizing is set up and ready to use. 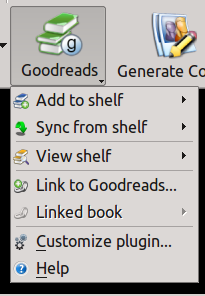 Clkick on the "Sync from shelf" option under the goodreads icon. You may have some books on your goodreads shelves that you read paperback versions of and therefore do not have them in your calibre library. These books will be labelled as "No Calibre book linked" in the new window that opens. You can right click on the book and it will give you the option of adding an empty book to calibre with the metadata stored for your records. See figure below where I have added empty ebooks for the first two unlinked books. Search the internet plugin: This plugin was developed by Grant Drake. Click here to go to the mobileread forum on this plugin.This plugin allows you to search the internetplugin in the main toolbar as well as the search options it allows for. Some other plugins of interest may be Kindle Collections, Count pages and many more that are discussed here. Hope you found this post useful. See you again in about a week. The next few posts will deal with some of the more useful plugins in calibre. Functionality can be added to calibre via little code snippets called "plugins". The Calibre application itself comes with and makes extensive use of plugins developed by the Calibre development team. The Calibre plugins programming interface (API) makes it possible for users to write their own plugins, that offer additional features they find useful or override the default Calibre behaviour. For a full list of available calibre plugins click here. There is a help forum on mobile read dedicated to plugins. Please post here if you need help with developing or using a plugin. Today we will discuss one popular plugin; "Find Duplicates". The goal of this plugin is to find duplicate entries in your collection so you can delete or merge them. This plugin was developed by Grant Drake. The help forum dedicated to this particular plugin can be found here. Getting the Find Duplicates plugin: In the main calibre window click on Preferences and at the bottom left corner of the new window that opens click "Plugins". Now a window opens up with the list of available plugins. The "Find Duplicates" plugin is not on the default list so you will have to first get it. To do this, click on the "Get new plugins" button at the bottom left corner. A window with a list of plugins shows up. Choose the Find Duplicates plugin and click the install button on the bottom right corner. Restart calibre to see the "Find Duplicates" button in the main calibre tool bar. 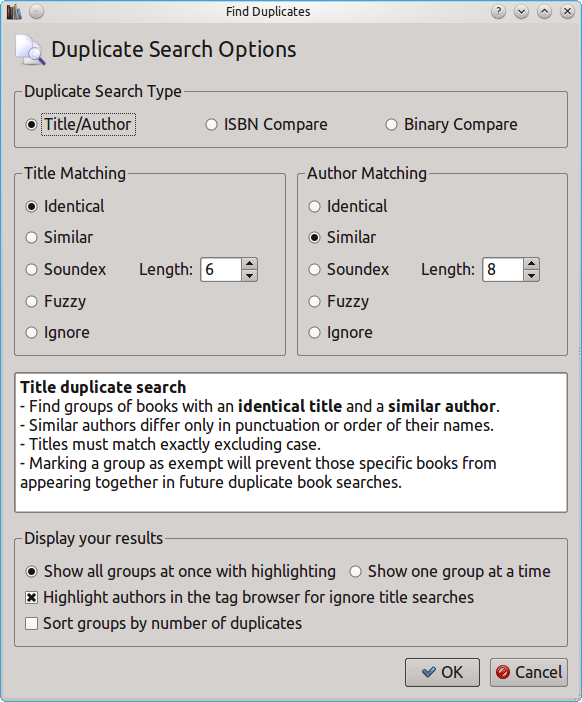 Duplicates by author or title: The first choice in the duplicate search type as shown in the figure above is Title/Author. This allows you to locate duplicates by either author name or by title or both. You can set one column to ignore if you want only to use the other. The figure below shows the duplicates obtained in my collection by setting the "Title Matching" column to identical and the "Author Matching" column to ignore. I have also selected "Show all groups at once with highlighting". The above figure shows all sets of books of the same title irrespective of the author names. Books of the same title are highlighted by the same color and grouped together. The two duplicate entries for say "The Columbus Dispatch" (highlighted in green) can be combined by selecting them both, clicking the little arrow next to "Edit Metadata" and selecting "Merge book records". Here you can choose to delete the extra files or keep them. Having done this, in the above figure, we are left with only one set of duplicates. Similar: The figure below shows the effect of setting the "Title Matching" column to identical and the "Author Matching" column to similar. Similar authors differ only in the punctuation or order of their names. Soundex: The figure below shows the effect of setting the "Title Matching" column to identical and the "Author Matching" column to soundex. Soundex authors also differ only in the punctuation or order of their names but can also include books where the author names have minor spelling errors so they sound similar like "Austen" and "Austin" in the example below. Fuzzy: The figure below shows the effect of etting the "Title Matching" column to identical and the "Author Matching" column to fuzzy. Fuzzy author matches compare using their surnames and only the first initial so they detect "Jane Austen" as well as "J. Austen" as shown below. This is the most general setting for finding duplicates. Duplicates by ISBN or binary: You can look for duplicates by comparing ISBN. This will allow you to search for books with identical ISBN and the author and title matching becomes disabled. Similarly Binary searching allows you to look for duplicate occurances of a file even if the title and author are different provided the actual files are identical. As shown in figure below "P&P" by "Unknown" contains the same file as "Pride and Prejudice" by "Austen Jane", "Jane Austin" and "J. Austen". They all contain the same identical text (.txt) file. While "Pride and Prejudice" by "Jane Austen" contains a different epub file. Hope you found this post useful. See you in about a week with details on some more plugins. I am sorry but Kovid and I moved into our own apartment this week in India, so we have been very busy setting it up. I regret to say there will be no blog post this week. I will try my best to be back on schedule next week. Also please bear with delays in response on various help forums, bug reports and some what irregular releases. We will try to be back on schedule for all of these as soon as possible. calibre is a comprehensive and free e-book management program developed by users of e-books, for users of e-books. It has a cornucopia of features including library management, ebook conversion, syncing with devices, news download, ebook viewing etc.